The author's kids sampling the Edelrid Fraggle II. Choosing a harness for your child can be a daunting process. Especially if you're unfamiliar with the options – both in terms of products and set-ups – that are available to you. 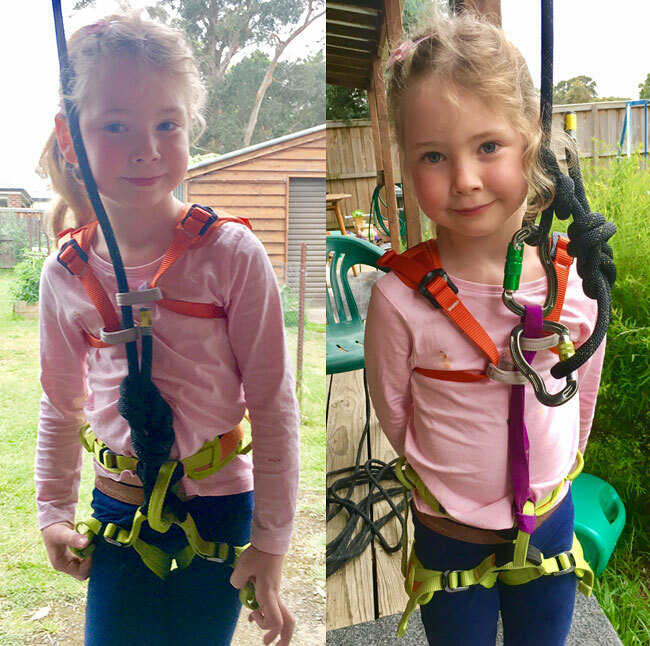 Recently, I've been asked by many parents about kids’ harnesses and, in particular, harnesses for small children. So I decided to write an article with my thoughts, here. There are two main things you need from a kid's climbing harness. It needs to stop the child from going upside down. Full-body harnesses (e.g. Edelrid Fraggle II). Sit harness and a chest harness combination (e.g. Edelrid Finn and Petzl Body Children's Chest Harness). Whether you use a full-body harness or the combination of a sit harness and chest harness, you'll get the same outcome: a set-up that stops your child from going upside down, and a set-up that stops your child from falling out of the harness. So, why would you choose one option over the other? What your child will tolerate. 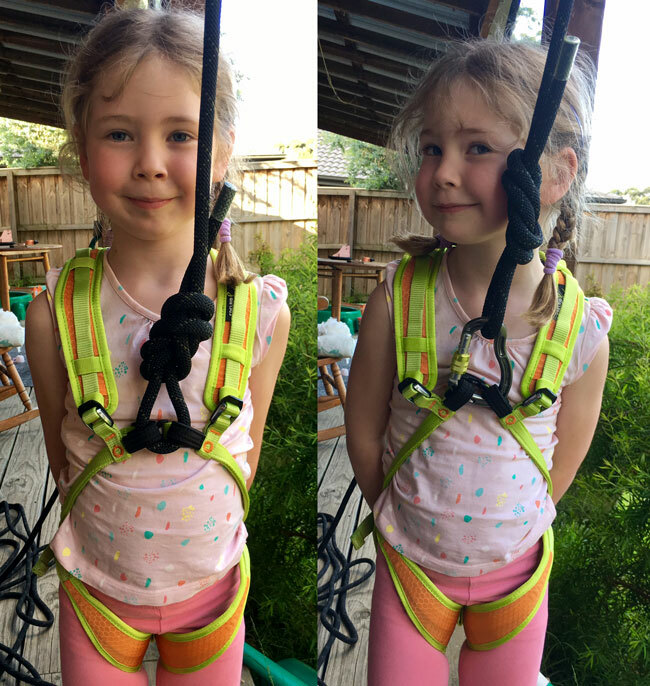 Some kids hate full-body harnesses; some hate the clutter of two separate harness components. Likewise, some kids hate the tie-in knot in their face; it doesn't really bother others. What fits. For instance, if you have a very young child, you might not be able to find a sit harness that's small enough. Photo 1 (above left): Full-body harness – single-attachment method, using rope to tie in. Photo 2 (above right): Full-body harness – single attachment method, using carabiner to clip in. For young children, full-body harnesses are the most common choice. Tying into a full-body harness is pretty simple. There's one central attachment point, so you'll be passing the rope or carabiner through this point (see Photo 1 and Photo 2). If you're climbing at a gym that requires being attached to the rope at two points (e.g. two locking carabiners, or a combination of a tie-in knot and a back-up locking carabiner), tying into a full-body harness remains simple. You'll be passing both the rope and carabiner (or both carabiners – whatever the particular set-up at your gym is) through the same central attachment point. Easy. The harness is one unit. There's one attachment point, which makes tying or clipping into the harness idiot-proof. Same attachment point whether you use the single- or double-attachment method. Photo 3 (above left): Sit + Chest harness set-up – single-attachment method, using rope to tie in. Photo 4 (above right): Sit + chest harness set-up – double-attachment method, using two carabiners to clip in. There are several ways you could do this. Here's what I do: I thread the rope down through the chest harness attachment points (see Photo 3), then tie-in to the sit harness as per normal. Here's what I do: I get a 30cm sling and lark's foot / girth hitch it to the sit harness' belay loop. Then, I thread this sling through the chest harness attachment points and clip-in there (see Photo 4). The downside to this configuration is that the knot/carabiners sit in your child's face (like it does with the full-body harness set-up). Using the single-attachment method, the tie-in knot is low and out of your child's face. 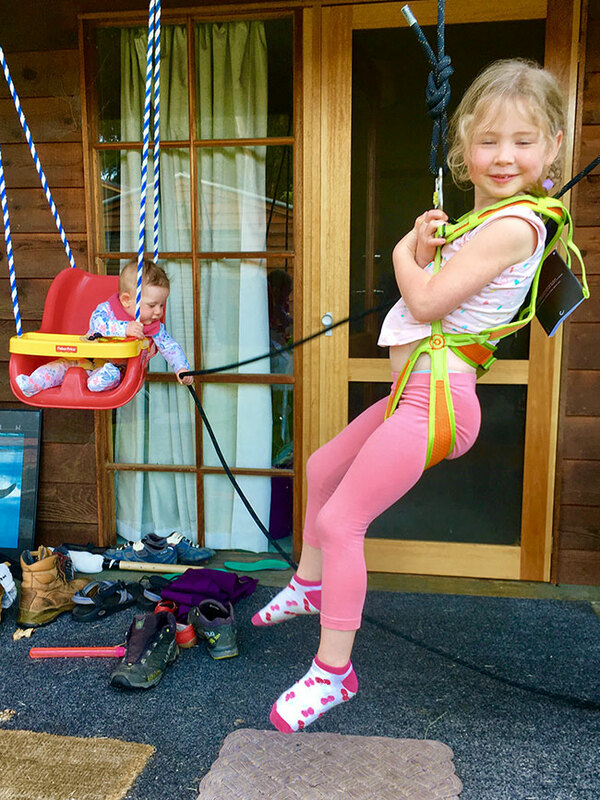 When the child is older, you can ditch the chest harness and you won't necessarily need to buy a new harness, because you'll already have a sit harness. The child will become accustomed to a sit harness from the start. Using the double-attachment method is a bit fiddly. There you have it. Climbing harness options for kids, and the advantages and disadvantages for each. See our range of rock climbing harnesses. Need help choosing a kid's harness? Visit us, email us or call us (03 9600 0599). WHICH CLIMBING ROPE SHOULD I BUY?